This beautiful home was renovated by a long time local with style and function in mind. 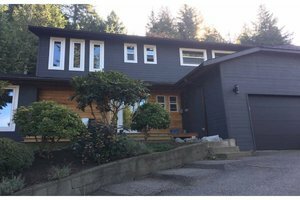 Located on one of the best cul-de-sacs in Squamish in a low-traffic neighbourhood, and sitting on a 12,000 sq/ft lot that backs on to green space with gorgeous mountain views. Open concept living with a large kitchen and oversized island, high-end appliances, and an abundance of storage. A high efficiency wood fireplace heats the entire home, with 3 bedrooms up and a separate office and den on the main floor. People want to live on this street, come and find out why. Open House on Sat Nov 10 from 1 to 4 pm, and Sun Nov 11 from 1 to 3pm.